Two girlfriends and I were sitting outside a suburban Melbourne café, toasting a recent birthday. The sun was shining and we had a scenic view of the Yarra River. We were surrounded by majestic trees, colourful cyclists, and energetic rowers. In a very off-hand manner my friends mentioned that they were both thinking of going to Paris and asked if I would like to join them. They couldn’t even finish the sentence without giggling and I could tell both thought the idea was great, but that it was a bit ‘pie in the sky’. A trip away to Paris. I took their brilliant concept and ran with it ….why indeed NOT?!!!! After a few short weeks of flurried phone calls and to and fro texting to try and find a two week period that three women (who were also busy wives and mothers of even busier nine children) could in fact, run away to Paris for a much needed getaway. Miraculously, we found a window that seemed to please all husbands and children involved. Tickets and accommodation were promptly booked (following some great research and leg work from my friends)…Our adventure to Paris was set to go!!! Most of the flight was spent celebrating the fact that we had managed to escape on a whimsical adventure. I marveled at how relaxing it was to travel without my beautiful but boisterous and demanding family. The peace and quiet was delicious. Paris, here we come. As this was my maiden trip to Paris, my eyes were wide open from the word go. I was pleasantly surprised to find that the Parisians were quite tolerant of our non-existent French vocabulary. Most people were happy to try and help with our queries. Below I have listed, in no particular order, our ‘ Top 10’ experiences. This ended up being my absolute favourite gallery. The art work is held in a converted railway station which makes the building a remarkabkle home to an extensive and exciting art collection. Within the museum, there are two fantastic cafes – check them both out before you decide which one to dine in. We ate in the very nice and reasonably priced café. On our way out of the museum, we stumbled across the more spectacular and lavish café. It’s worth just peeking through the doors to see its spectacularly ornate interior, even if you decide not to dine there. 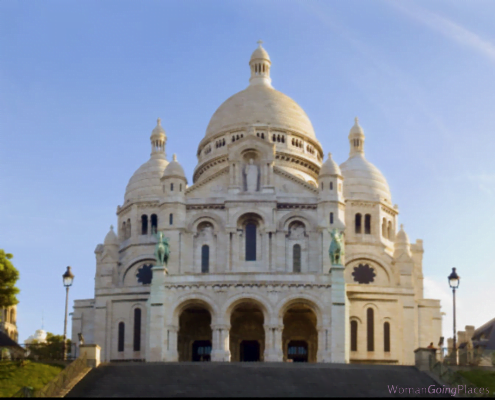 Lots to see and do, including the Sacré-Coeur basilica, a fantastic Dali exhibition (just happened to be on) and a zillion tourist shops – a good place to nail lots of pressies. It started to get late and as daylight slipped away the lights on the famous black lamp poles illuminated the streets with a warm glow. The high vantage point treated us to spectacular views of the city. As night drew in, parts of the city became a bit sleazy – but even that had a charm of its own. Slightly further out, but really just a few train trips and so worthwhile. Imagine narrow walkways in between dozens and dozens of permanent market stalls, housing French antiques of all sorts. I wish I had an apartment in Paris that I could furnish and decorate with these French antiques. 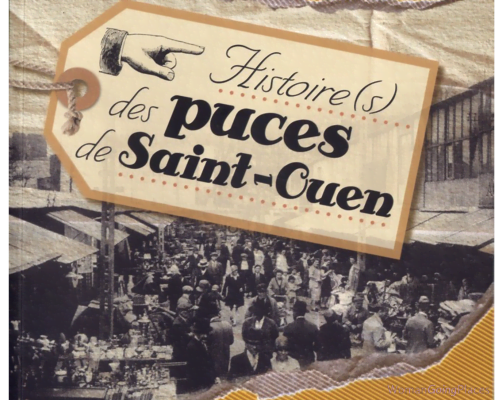 I visualised all the French antique shop owners back home buying up big here and shipping it into their expensive shops in Melbourne’s Armadale and Malvern. Beautiful light fittings, tables and small furniture, antique collectables of all sorts, silverware, antique posters. The stall owners were as charismatic and authentic as the merchandise they were selling. If it weren’t for the freezing cold conditions and the persistent rain, I felt I could have fossicked there all day. A short walk from here and you will stumble upon another market. A more conventional market selling clothes, food, bags etc. The main part of the gallery was unfortunately closed for renovations. The garden however was open. There were numerous Rodin sculptures tastefully displayed in a beautiful garden that I could imagine would be absolutely stunning in the warmer months, when the now bare rose bushes would sprout glorious flowers. The coffee shop (albeit in a temporary building) provided us with a very enjoyable refuge from the cold. Definitely factor in a pit stop here as the food choices were great and the prices reasonable. Often referred to as ‘the old Paris’ and located on the right bank of the river is the Marais district. Meandering around the cobblestone streets is an absolute must. It has a much more lively and playful vibe than the more conservative city centre of Paris. It is filled with boutiques (some decent damage to the credit card was achieved here). Lots of fashion and jewellery shops (or is that because they were the shops I happened to focus on?). I also recall many small galleries and hidden courtyards. The Jewish Quarter is located here. We visited the Jewish Museum and filled our bellies with the best felafel any of us had ever eaten- in L’As Du Fallafel (32-34 Rue des Rosiers). Our late arrival of 3:30 pm meant that we avoided the customary long queues and were able to be seated immediately in a their large restaurant, crowded with locals and tourists. 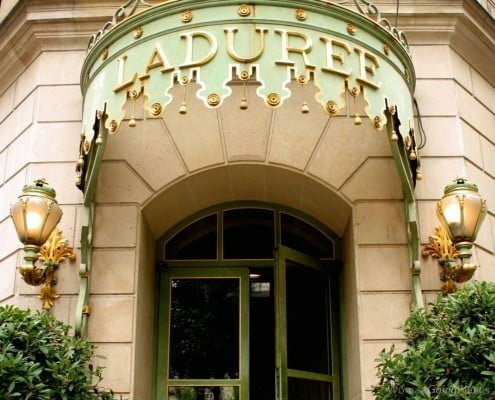 On our very last day in Paris, we got up early, dressed in the most glamorous clothing we had and ventured out to breakfast at the famous Ladurée. A very ostentatious place to go for ‘high tea’. 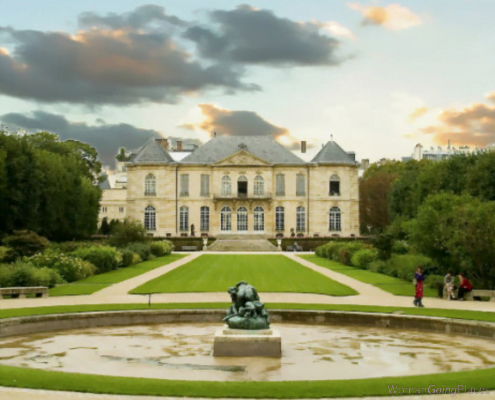 It has an incredibly ornate French interior – visualise lots of gilding, mirrors, totally gorgeous and over the top. Photos in this building are banned (destroys the posh ambiance). The tea/menu service is truly an experience. We admired the silver, the tea cups and crockery, even the napkins and of course the presentation of the food. Our waiter was a young opera singer (unfortunately he has been banned from performing for his customers. He used to be able to do this on request, but started to get into trouble as he was neglecting his waiting duties). Don’t forget to look up at the ceilings, and a trip to the bathrooms is also well worth a visit for its grandeur. Definitely book ahead (one or two days should be fine, leave a bit more lead time if you’re after a weekend booking or in peak tourist times) and request to be seated upstairs. There’s a lovely shop downstairs, so on your way out you can purchase some of the beautifully packaged sweets. They make great gifts. I don’t even eat pastries – but I couldn’t help myself. I just had to stop and admire each window display of every patisserie or chocolatier shop we passed (there were so many). 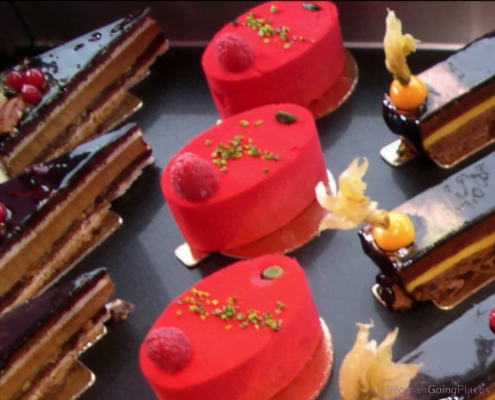 They all looked wickedly delicious and sophisticated – very Parisian. My friends assured me they were every bit as good as they looked. It seems as if on almost every corner there is a bar/restaurant. They seemed to be mainly filled with red lounge chairs. We found our local favourite and popped in most evenings on the way back from the train station en route to our apartment. Early on the waiters recognized us, seated us in our regular armchairs and served us our ‘usual’ for drinks and snacks. 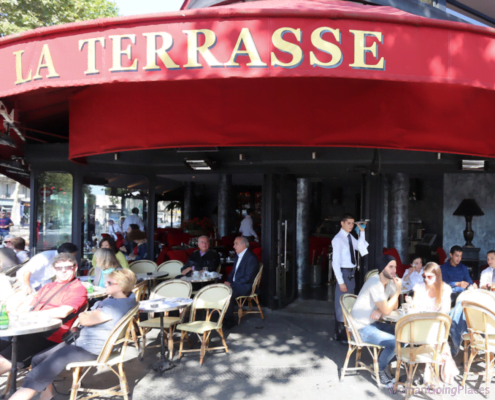 Our local was called La Terrasse (although we named it the ‘Rouge Lounge’). The service was excellent, the ambience perfect – a great place to unwind, reflect on our accomplishments that day and watch the locals and tourists passing by. 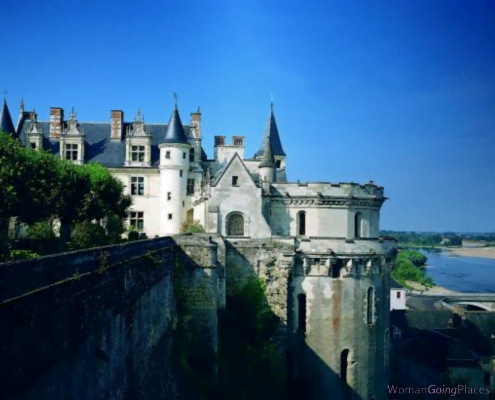 A region of vineyards, floral gardens and many chateaux (castles). On my next trip to Paris, I plan to spend a couple of days in this region rather than squeeze it into a day trip. It took roughly three and a half hours to reach there by train, leaving only time for a half day trip to visit two chateaux (there were so many more to see). The castles were amazing and the scenery en route was beautiful countryside. I can envisage spending a few days cycling around this gorgeous town in my next visit (if I had money to burn maybe even renting a small chateau to stay in). We did this in the evening. The views were stunning and not at all compromised by the blanket of night. As there were no queues, the whole experience took under an hour. Not quite making it into the Top 10, but definitely worth a mention, and a visit, is the Père-Lachaise cemetery (20th arrondissement). It’s huge. You will find many tourists looking for the graves of famous people like Jim Morrison and Rita Hayworth. A lesser-known destination, but one I found totally charming is the Shakespeare and Company Bookshop (5th arrondissement). This is a good place to pop into when you are visiting the Notre-Dame Cathedral (as it’s just across the bridge on the eastern half of the Île de la Cité in the 4th arrondissement.) It’s a tiny bookshop that has inherited the tradition of the original. It houses both second-hand and new books (beware, you could barely swing a cat in there) but it has a special feel – I almost felt well-read and literate by just stepping in there and taking a browse. Be cautioned though – more than a few books make for heavy weight in your suitcase. Definitely fit in a cruise down the Seine. It provides a picturesque perspective of the city and plenty of photo opportunities. It’s helpful to get an overview of the city on the first day. You can achieve this by going on the ‘hop–on/ hop-off bus’. * The Metro was a great way to get around and very user friendly. We purchased ten single-ticket rides. (cheaper than buying individual tickets). We eventually learned not to store these tickets together with our credit cards – it deletes them. * Here’s a very important tip – Don’t queue for the Louvre! We pre-purchased tickets from an outlet in the nearby underground shopping mall. 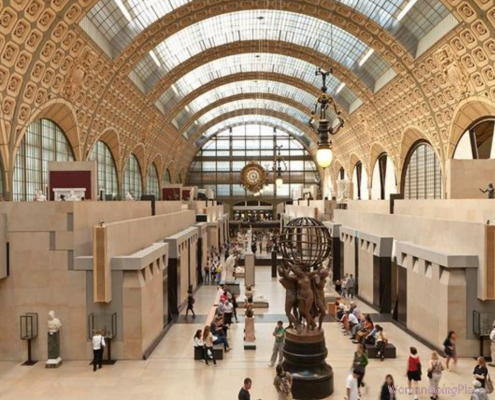 Alternatively, you can purchase the Paris Pass or Museum Pass. In our case this saved an hour and a half of queueing (and that was in the off peak period). * DON’T use a selfie stick – very unchic! * It was definitely worthwhile travelling off peak in the cooler months as it meant minimal queueing (we hardly saw any waiting lines – with the exception of the Louvre). It also meant our flights and accommodation were considerably cheaper – leaves more money for shopping! Just make sure you have a very, very warm coat – it’s an absolute essential. * Always arrange a back-up place to meet if you get separated or lost (in case phones not working or if they run out of batteries). Our meeting place was usually the museum shops. * Carry a spare phone charger with you. We found this very handy as using Google maps and taking photos both chew up the battery pretty quickly. * Baguettes are baked so frequently and are so readily available. Get into the local mind set of buying one baguette in the morning and then another one freshly baked in the afternoon/evening. A big French no no is to eat in the evening a baguette you bought in the morning. * Dress très chic. If you’re wearing athletic gear, you had better be running or exercising. It is unacceptable to be walking the streets in runners or tracksuits whilst you’re in the fashion capital. * A visit to the Galeries Lafayette (9th arrondissement) is worthwhile if you like large department stores. I personally prefer the smaller, more personal service of the unique boutiques, but Galeries Lafayette has an amazing dome roof and apparently you can get out on the top level for a great view of the city (we missed this). From time to time Galeries Lafayette holds fashion shows. You can ring ahead and check. It is possible to get a refund of the 10% VAT but you must produce your purchased goods in the airport and by the time you wait in line at Galeries Lafayette for the paper work and then again at the airport – you may be tempted not to pursue this refund. * Duty free shopping at Paris airport was surprisingly good – a final opportunity to buy presents for loved ones. * I’m sure this is not news to most of you, however no matter how much your travel agent may assure you, ensure you have a minimum of an hour and a half in between connecting flights. This will greatly improve the chances of both you and your luggage arriving to the intended destination on time! * If you luck out and your luggage misses your flight, you can request compensation (you are entitled). We did this upon arriving in Paris. 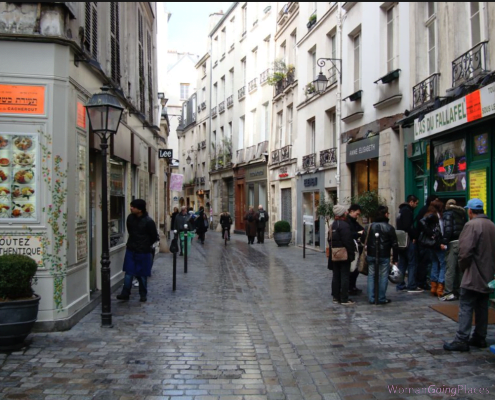 * A couple of cute stores to visit; Merci in the Marais (111 Boulevard Beaumarchais) – a cool lifestyle store, and Monoprix (3 locations in Paris) – fun, affordable homewares, food and fashion. * Stay in the Marais; spend a few days in the Loire and Bordeaux areas (rather than just day trips); make it to the Pompidou Centre (closed on Tuesdays); visit Versailles and the Luxembourg Gardens (ran out of time). * One more piece of advice, when relaxing on the aeroplane, don’t forgot to supervise your steward when he passes your neighbour their hot beverage. Make sure he passes it in front of you rather than over your head, so that if he accidentally drops the whole cup of steaming hot coffee, it won’t spill (and burn) all over your head, face, clothes and seat! 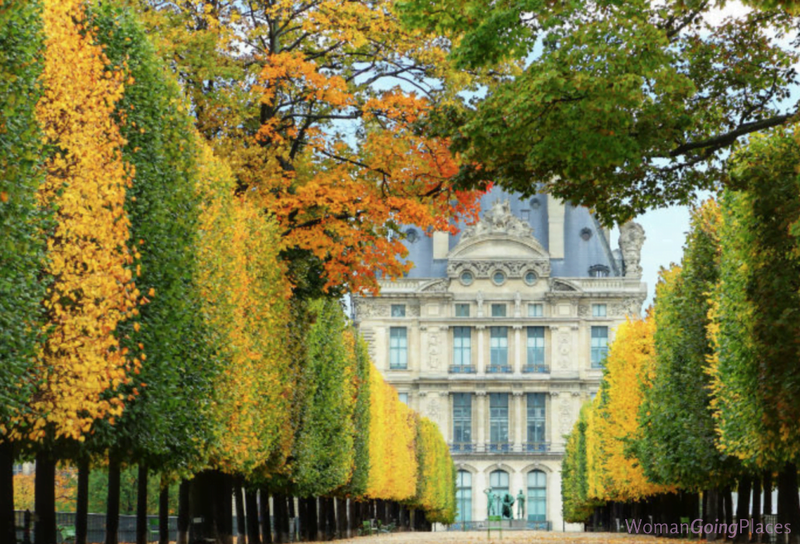 If you’re planning a trip to Paris…Bon Voyage! 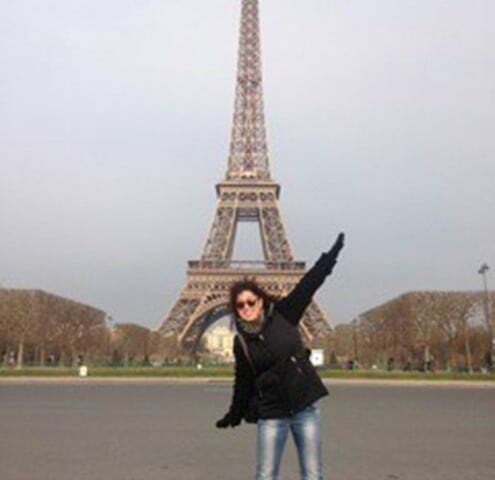 Jackie Pila is a Melbourne social worker, art therapist, mother, and is passionate about travel. In her spare time, she enjoys boxing and Brazilian Jui Jitsu. This trip was a rare opportunity to escape daily life and immerse herself in a wonderful French experience.